Last weekend saw Tayport kick off 2019 in earnest, but their first competitive fixture of the new year turned into something of a disaster. The Canniepairt men suffered a highly disappointing defeat against Lochee Harp in a Thornton’s Property East Region League Cup tie at Downfield Park. Despite taking the lead, ‘Port ended up losing 3-1, with Harp’s goals all scored by former Tayport players. On the quarter hour ‘Port deservedly opened the scoring when Robertson netted from the penalty spot. On 52 minutes, Harp attacked down the right. 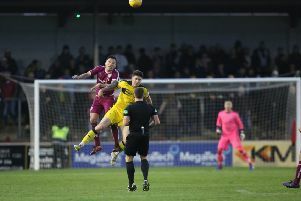 What looked like a foul on Grant Paterson was ignored and McDonald got in his cross, which found Lloyd Young, who finished clinically from eight yards. A few minutes later, there was a chance for Stevie Kay’s men to restore their advantage. A fine crossfield pass from Jamie Mackie found Josh Chalmers, but the ‘keeper saved, at the expense of corner. Chalmers then had another opening down the right side, but elected to pass inside when a shot might have been more productive. On 75 minutes, Kieran Conway picked up his second caution of the game and his red card meant that Harp could smell blood. Two minutes later, there was a stramash in the Tayport goalmouth and Shaw made two great saves. Young got possession of the loose ball and made his way along the six-yard box. The referee thought he was nudged and awarded a penalty. Young duly netted and Harp were on course for an upset. After an attack down the left, Shaw managed to block McDonald’s shot. However, the ball fell perfectly for a competely unmarked Connaire Connelly, who will never score an easier goal. Tayport: Shaw, O’Brien, Trialist (Rollo), Conway, Mackie, Duffy, Gill, Suttie (Kay), Robertson, Chalmers (Trialist), Paterson.